Like many other Marvel Cinematic Universe characters, the Guardians of the Galaxy have been re-positioned to also appeal younger audiences through an animated TV series. We had seen the same treatment applied to the Avengers before them and clearly Disney changing the core playbook. The Guardians of the Galaxy cartoon largely follows the characters established in the movie franchise but with touches of the older comic book series in terms of supporting characters. Thus it's an odd mix of the old and the new and I rather enjoyed it. It's not the best cartoon out there, and I often feel this way about Marvel's animated ventures on TV and home video. But it's close enough to remain fun and that's not something to be sneezed at. But at the same time there were rather shallow bits, which were a natural consequence of being a show marketed towards children but that always feels like a shame. After all the Guardians initially felt a lot grittier during their 2008 relaunch and I still look for that vibe when I encounter properties related to them. Synopsis: Guardians of the Galaxy is an animated television series developed for television by Marty Isenberg. At the time of this blog post the show has already been confirmed for a third season on Disney XD. The Guardians of the Galaxy are already a ragtag team at the start of this series as they get into various misadventures together. Things start off when they acquire an artifact known as a Spartaxian CryptoCube that somehow only responds to the touch of Peter Quill the Star-Lord (Will Friedle). Somehow the cube acts as a map to Cosmic Seed energy strewn across the galaxy and the Guardians decide its in their best interests to follow the trail and secure the Cosmic Seed. The Cosmic Seed is said to have the power to create a new universe, but to do so would destroy our present one. Thus the Guardians feel they need to find the Seed in order to keep it out of the hands of Thanos (Isaac C. Singleton Jr.) and other less than trustworthy figures out the galaxy. Along the way they encounter foes old and new such as Nebula (Cree Summer) the sister of Gamora (Vanessa Marshall) and of course Yondu (James Arnold Taylor) and his Ravagers. 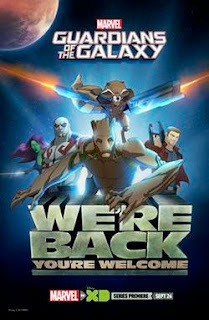 What I Liked: Given my frustrations over how the MCU version of the Guardians of the Galaxy dropped a lot of things from the original Dan Abnett and Andy Lanning comic book series, it was such a relief to re-encounter them as a part of this cartoon. One of the best examples of this is the telepathic Cosmo the Spacedog (James Arnold Taylor), restored as chief of security of Knowhere. It's a seemingly minor thing but I love characters like Cosmo and the original Mantis (Jennifer Hale) so it's only fitting to see them depicted well. And the show has a decent amount of fun with itself and the quirks of the individual team members. You really do get a sense of them actually working together as a team somehow and it all still works out for the best. That's not always easy to write without resorting to a lot of overly dramatic sentiment tacked onto the whole story and thankfully things don't go down that road. What Could Have Been Better: The stories seem tightly bound to the MCU timeline in more ways than one instead of simply going for its own story world. It's not like they committed to create a new sense of continuity between the movie and the series so they should have just gone for it. This feels especially true in hindsight as focusing the first season on the Cosmic Seed really doesn't make all that much sense now given how Guardians of the Galaxy Vol. 2 played out. And some of the individual character is really flat. Rocket (Trevor Devall) sounds pretty silly with all his threats of murder and such as I didn't like it in the comic and it still doesn't translate into anything useful in the series. Gamora doesn't have much going for her other than her general combat skills, making fun of Peter and her animosity towards her sister and so on. They all feel like caricatures of their movie selves except maybe for Drax (David Sobolov) - he actually makes a bit more sense than what he has become in the second movie. TL;DR: Guardians of the Galaxy rather works as a cartoon and it still offers a lot of fun for everyone. It's probably the only way we'll get a feel of the 2008 comic in these modern times so that may be enough for me. Thus the show gets a good 4 times the team fights among themselves out of a possible 5.